After qualifying from Glasgow Vet School in 1996, Iain emulated James Herriot for 2 years in Yorkshire before following his wife south to concentrate on small animals. 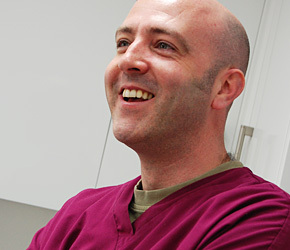 He developed an interest in eyes and was awarded the RCVS Certificate in Veterinary Ophthalmology in 2008. Since then he has furthered his studies in this field and although enjoys all aspects of small animal medicine and surgery, is particularly keen to see ophthalmic cases. He loves to spend his free time down the beach windsurfing with the occasional dabble into kitesurfing. I obtained my veterinary degree and future husband from Glasgow university in 1996. I remember deciding to be a vet whilst operating on my teddy bear at a very young age. This would not necessarily be the best time to make such a decision but it turned out pretty well. I have found it to be a challenging and rewarding career. There are sad times but there is nothing more rewarding than making an animal feel better and touching the lives of their family. I have made many friends over the years both four legged and two and have many fond memories of them all. I began life as a vet in 2012 following degrees in Veterinary Medicine from the Royal Veterinary College London and Animal Science from Nottingham. Having always had a passion for all those small and furry it was an easy direction to focus on small animal practice. I spent the next four years with a lovely practice in Kent before moving back to Sussex to be nearer to my family. I have developed particular interests in both soft tissue and orthopaedic surgery which I aim to pursue further in the future. I greatly enjoy the challenges this career brings and, whilst it can be sad at times, it’s heartening to know that we have always done our best for the animals in our care. At home I have a cheeky Jack Russell called “Rodney” who loves playing at football and a cat who responds grudgingly to the name “Stinky Pete”! Fortunately they get on really well. I look forward to meeting your pets and will always be available for cuddles. After volunteering in animal shelters from a young age, Louise knew her dream career would involve her love of animals and helping others. She graduated from the University of Nottingham in June 2018, then decided to move to the warmest part of England so she could spend her free time by the sea. Louise enjoys the challenge of medicine and facing something new and exciting every day, although sometimes she wishes our pets could just tell us what is wrong! She can’t wait to give your pets a lot of fuss and the care that they deserve. In her spare time Louise enjoys painting, yoga and going on beautiful hikes. She dreams of one day owning her own small holding complete with pigs and chickens. Jess has a special talent. She has an amazing ability to remember every animal she has met and its name. We invite you to test her out! Jess has a gentle way with animals and she can win over the most nervous of patients. 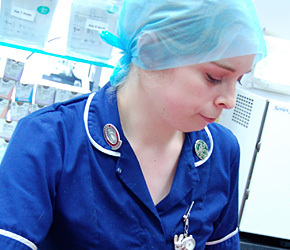 Jess is a special breed of nurse trained at the RVC for four years to gain a degree in Veterinary Nursing. This doesn’t just mean she is very clever but that she is highly trained and skilled and keeps us all on our toes. Jess was torn whether to be a nurse or a teacher so she satisfied that wish by becoming an assessor and training the nurses of the future. Jess literally can’t help but bring her work home with her so her pets Barley, Arabella and Capstan came with problems but at least they couldn’t have come to a better home. Clare is a Ferring girl through and through. She worked for many years in Ferring post office, which her parents used to own, so many of you already know her. Clare married her childhood sweetheart, Matt, just around the corner from the surgery at St. Andrew’s Church shortly after joining us in 2013. Despite being a busy Mum of two, Clare works full time and will always have a smile for you. She is a very cheerful addition to the team. Laura has been a veterinary nurse since 2007 but has worked in the veterinary field since her weekend job at the age of 16. Before qualifying as a veterinary nurse, Laura completed a national diploma in Animal Management. 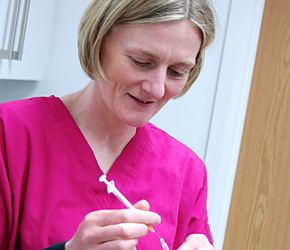 Prior to joining Ferring Street, Laura worked in a large veterinary hospital but decided she wanted to work somewhere she could get to know her patients and their owners better. Outside of work Laura enjoys baking for her colleagues and brings in delicious cakes on a regular basis. She has two cats called Heinz and Bagheera who have turned into a “crazy cat lady”! Jo joined us in 2016, moving to the south coast to be by the sea. She qualified in 2012 and likes working in a small independent practice and being part of a team. She is a lifelong Liverpool fan and spends her spare time following the team and looking after her beloved 18 year old cat. Anna qualified as a veterinary nurse in 2017, but became a part of the team 3 years prior in 2014, when she began her training. Anna has grown up with animals and always knew this was the career for her. After only a few months working with us full time, Anna managed to adopt a cat that made its way through our doors – now known as the very spoilt Lola. Outside of work, Anna enjoys performing burlesque, sipping cocktails and cat cuddles on the sofa. She has also recently got involved with Street Vet – helping the animals of the homeless. Bella is our up and coming student veterinary nurse. She volunteered with us one day a week for a year before joining us full time at the end of 2017. Bella lives locally in Goring-by-Sea and has a one year old cocker spaniel called Daisy. You can find her sipping cocktails on her time off! After finishing university, Caz started a family with her husband. When it was time to return to work she decided that her love for animals, dogs in particular, would be well suited to a position as a veterinary receptionist and she took up a position at a veterinary referral centre in Brighton, before joining the team at Ferring Street Vets in 2015. Caz loves all sports, particularly martial arts, cycling and rugby. She spends most weekends watching her teenage son and daughter play rugby. Caz has a bulldog named Buster who she re-homed in 2017 and a white cat called Chester who thinks he’s a dog! Lesley has been with Ferring Street Vets since October 2016. She has lived in Ferring for ‘donkeys years’ and has a menagerie at home: Moll the Cocker Spaniel, Coco the very geeky Ragdoll, a pond full of fish and an aviary full of budgies and a cockatiel. She also babysits guinea pigs! Mel joined Ferring Street Vets in June 2018. WIth her 20 years customer service experience and love for animals, this is her dream job. When not helping our human clients, Mel can usually be found sat on the waiting room floor having cuddles with our furry clients! Mel lives with her husband, 11 year old son, two cavapoos called Mabel and Willow (AKA ‘The Angels’) and her elderly cat Poppy. Eileen joined the team at the end of 2018 after working in aviation industry for 18 years. She loves working in the veterinary environment where she can chat to clients and enjoy the animals. She has a ragdoll called Teddie at home. Rebecca is our newest member of the team after joining us in January 2019, fulfilling a long held wish to be a veterinary receptionist as it combines her love of animals and meeting people. She lives with her husband and two dogs: Ceitidh, an Irish terrier and Teddy, a Westie – both who enjoy taking up a lot of her time! Laura spent 10 years as a veterinary nurse in Australia, before moving into practice management in 2016. She started at Ferring Street Vets in November 2018 after making the move to the UK earlier in the year and spending 6 months on the Isle of Mull in Scotland. Laura has a lifelong love of animals and people and hopes to be a valuable addition to the team. She is learning to play the bagpipes, much to her neighbours’ dismay.